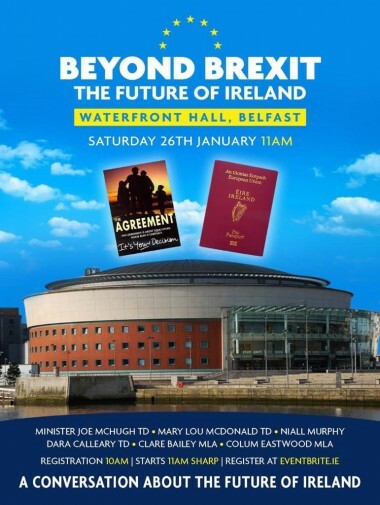 Last Saturday a landmark conference was held at the impressive Waterfront Conference Centre in Belfast entitled 'Beyond Brexit: Ireland’s Future’. 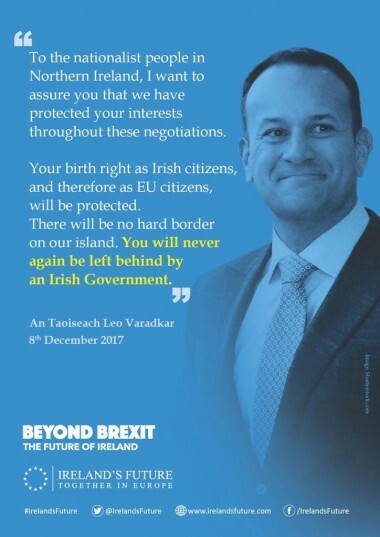 This event was organised under the brand name of Ireland's Future by the collective of individuals which had been the driving force behind the civic nationalist open letters to An Taoiseach and Irish Government in December 2017, February 2018 and, most recently, November 2018. Saturday's conference occurred amid the unfolding chaotic mismanagement by the British government of the Brexit catastrophe, as well as the deepening political crisis in the north of Ireland due to the denial of rights and functioning democratic political institutions by the DUP. 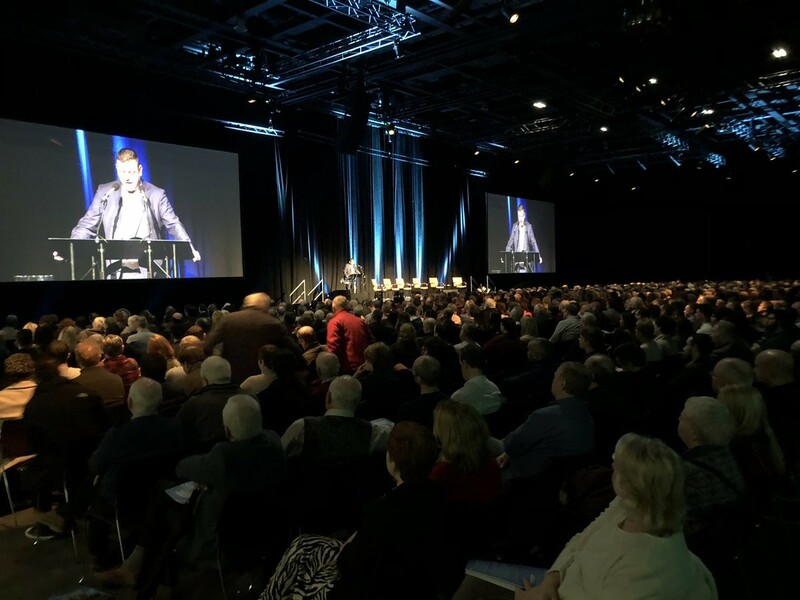 Nearly 1,500 attended this conference from all shades of republican, nationalist and other strands of progressive opinion. 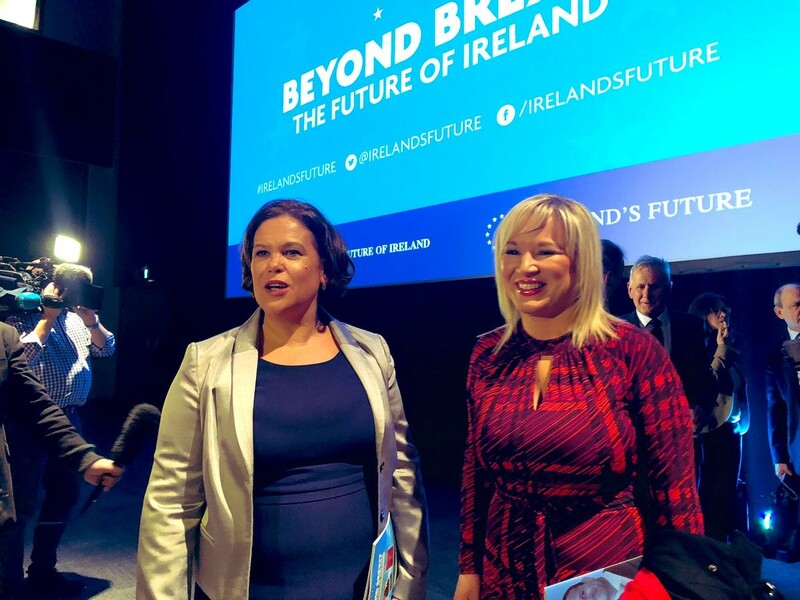 The keynote speakers included Irish Government Minister Joe McHugh, Sinn Féin President Mary Lou McDonald, SDLP Leader Colum Eastwood and Fianna Fáil Deputy Leader, Dara Calleary. It was a visceral manifestation of the popular nationalist discontent which currently exists in the north of Ireland against the onset of Brexit; British government policy towards the north; the actual threat against the basis of the Good Friday Agreement (GFA) from the DUP and British government political alliance; as well as the DUP's subversion of citizens' democratic rights and political institutions in the north of Ireland. While much anger was expressed about the scale of the current crises, many presentations from speakers and panellists focussed upon the political realignments which are taking place and the momentum driving the discussion on Irish reunification. There was a significant emphasis from all of these contributors on the need for generosity and flexibility in accommodating the unionist section of our community in the context of future transition and constitutional change. Political and constitutional changes to the existing status quo will need to be underpinned by new compromises and accommodations to address the concerns of unionists and also copper fasten guarantees, which secure their future in a new pluralist, constitutional, national democracy on the island of Ireland. Those of us committed to achieving such transformation in the shape of an agreed, united Ireland have a responsibility to commence a process of dialogue with our unionist neighbours about their pivotal role in shaping the future with the rest of us; and to prepare the context for such a seminal negotiation. That combined with irreversible demographic changes and the inability and refusal of political unionism to embrace power-sharing have created a new reality. The 'Beyond Brexit: Ireland’s Future' conference has now mainstreamed the debate on Irish unity. But, our society remains deeply divided. The need to tackle sectarianism and address the development of reconciliation and healing cannot, and should not be ignored, or postponed any longer. This work needs to be urgently progressed in the here and now regardless to the timing of constitutional change. On Monday night 'The View from Stormont' Ulster Television broadcast carried an interview with me about all of these issues. It was trailed with a challenge from Progressive Unionist Party Cllr John Kyle, who said that Sinn Féin had to make a choice between commitment to reconciliation or an Irish unity referendum. I have had a long standing engagement with John. I have found him to be a decent man who genuinely cares about the welfare of his constituents. However, I consider his remarks were mainly to do with electioneering; but that aside, his assertion was both wrong and offensive. It is equally valid for republicans to campaign for a new, agreed united Ireland, and to seek the development of a reconciliation and healing process. For republicans following the tradition of Tone, McCracken and Hope, these positions are inseparable. The narrative which attempts to delegitimise Sinn Féin's commitment to achieving the vision of the GFA in the form of a shared society, based upon anti-sectarianism and reconciliation, and ultimately an agreed, united Ireland, is completely spurious. It is also wearisome for republicans, in particular for those of us who have taken risks and have invested vast amounts of political and personal capital to promote this important work. Sinn Féin is the only party which has published policies on anti sectarianism and reconciliation; which has a pro active strategy of engagement; and, which creates public and private platforms to promote dialogue and progress. The fact is a corrosive 'project fear' is being orchestrated by political unionism. This 'project fear' reduces equality, rights, anti sectarianism, reconciliation, and healing to zero sum concepts: it misrepresents any progress on these huge challenges as wins for republicans, and losses for unionists. Now more than ever it is essential that we agree to unite upon the need to tackle the deep fault lines which maintain political and communal divisions in society. Yet, progressive efforts to do so are consistently frustrated by gate keepers within political unionism, and notable sections of civic unionism. These gate keepers politically and electorally profit, and maintain their dominance in society, from division and sectarian segregation. They discourage and intimidate others in civic unionism from challenging the negative thrall of their 'project fear'. The legacy of Lundy fuels their influence. None of this will deflect Sinn Féin from our commitment to building reconciliation and healing. 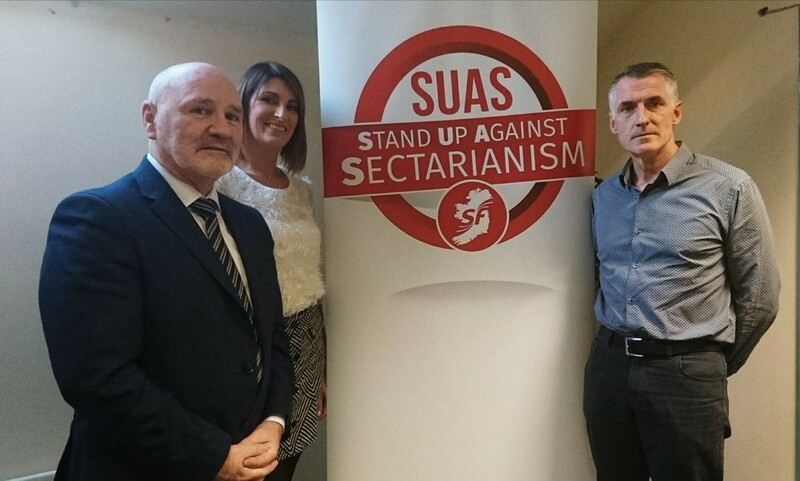 However, tackling sectarianism and developing reconciliation is not a one-way street. Republicans cannot advance this work on our own. The gate keepers have worked out that logic. Their dominance now poses the greatest impediment to developing a reconciliation process. Their negative influence must be brought to an end. That can only be done when courageous citizens committed to a shared society, reject "project fear" and the behaviour of the gate keepers. For as long as their toxic influence persists unchecked, then meaningful change in the north will be blocked, and prospects for restoring the political institutions will remain bleak. It is time for change champions within civic unionism to find their voices and speak truth to power. Equality, rights, respect, and reconciliation are central to putting the institutions back on a sustainable footing. It is no longer tenable for the British and Irish governments to continue subordinating the rights of the majority of citizens in the north and failing to implement the GFA, in order to appease the bigots and gate keepers within unionism. And that brings me back to the 'Beyond Brexit: Ireland's Future' conference. Partition has run out of road and Irish unity is on the horizon. An entirely new discourse has now opened up in society about how to shape the future of Ireland, north and south. Unionists should make their mark on, and influence that debate. Irish reunification is now the defining issue of our generation. That is equally relevant to unionists, and republicans, and to Britain, as well as Ireland. Political change between both islands is now unavoidable. The British and Irish governments have to adjust to this reality; to organise the transition to Irish unity; and, prepare for a unity referendum. We should all face into this debate with generosity, optimism, and open hearts and minds, as to what we can build together in the interests of all our people. The character of an agreed, united Ireland has to be imagined and negotiated. That in itself is an exciting prospect. All sections of Irish society need to be involved. In particular, the wider unionist constituency should be reassured, encouraged and enabled to assert their important influence on this unfolding discussion on our shared future throughout this island.